Web of Science: Where did the Icelandic horse originate? Where did the Icelandic horse originate? Ari fróði says in Íslendingabók that Iceland was settled from Norway. Some Celts came here around the time of the Settlement, but probably mostly without animals. Slaves owned nothing, and free men had much farther to come to Iceland from Ireland than from Norway. So our stock should have mostly have come from Norway. The Icelandic cow is a good example of the relationship between Icelandic and Norwegian farm stock. Research on the origin of the Icelandic cow show that it is quite closely related to a breed in Norway called Blacksided Trender and Nordland Cattle, but more distantly related to all other Nordic cattle breeds. Analysis of blood samples has shown that the DNA of Norwegian Blacksided Trender and Nordland Cattle has much in common with that of Icelandic cattle. The origin of the Icelandic horse has been researched twice. 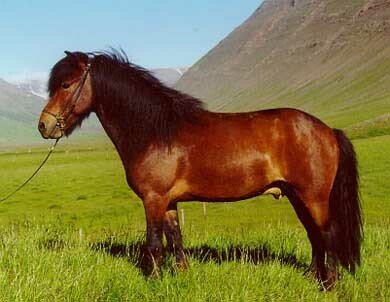 In the first instance the research aimed to establish whether an old Norwegian breed called the Nordland/Lyngen horse, was related to the Icelandic horse. Two Icelanders, one with specialised knowledge on the origin of horse breeds and the other an expert on horse gaits, went to Northern Norway in the autumn of 1998 to see if the Nordland/Lyngen horse had the rack (tölt) gait. Extensive molecular biology research on the genetic relations between horse breeds in Norway was conducted recently, and a doctoral thesis on the subject was defended in 2001. The research dealt with four Norwegian horse breeds, the Dales, Fjord, Norwegian trotter and the Nordland/Lyngen. The research also included two British breeds, an English racehorse and an English Standardbred and finally a Shetlands pony and a Mongolian horse. It should be noted that Norway conquered and annexed the Shetlands in 800 AD. All place names on the islands are of nordic origin.4 It is likely that the Norwegians took farm stock to the islands. The comparison described above showed that the Shetland pony and the Icelandic horse are closely related, and both more related to the Nordland/Lyngen horse than to any breed in the study. The breed most closely related to the three mentioned above was the Mongolian horse, followed by the Fjord horse, the Norwegian trotter and the Dale pony. The British breeds were more distantly related to the other breeds.5 The answer to the question about the origin of the Icelandic horse is that it came from Norway from where it had originated from Mongolia. Kantanen, J. 1999. "Genetic diversity of domestic cattle (Bos tourus)." University of Joensuu Publications in Sciences , No. 52 (doktorsritgerð). Stefán Aðalsteinsson og Bjarni E. Sigurðsson 1998. "Er forfaðir íslenska hestsins fundinn?" Eiðfaxi (10), 66-67. Kristján Eldjárn 1991. "Orð í belg um uppruna íslenska hestsins." Eiðfaxi (4), 4-6. Stefán Aðalsteinsson. „Where did the Icelandic horse originate?“. The Icelandic Web of Science 2.12.2005. http://why.is/svar.php?id=5453. (Skoðað 21.4.2019).